Team USA was handed its first loss in the 2010 Vancouver Olympics in the gold medal game against Canada. With a final score of 3-2, Team Canada won the gold medal denying Team USA its chance to win its first gold medal since the Miracle on Ice thirty years ago at Lake Placid. Hockey superstar Sidney Crosby scored 7:40 in an overtime controlled by Team Canada, making probably the most important goal in Canada’s Olympic hockey history since Paul Henderson’s goal against the Soviets in 1972. This all came after an amazing effort by Team USA to tie the game with a little over 24 seconds left in the third period, and down by one. Zach Parise scooted one past Team Canada’s Robert Luongo, to keep to the tense pace of the game. 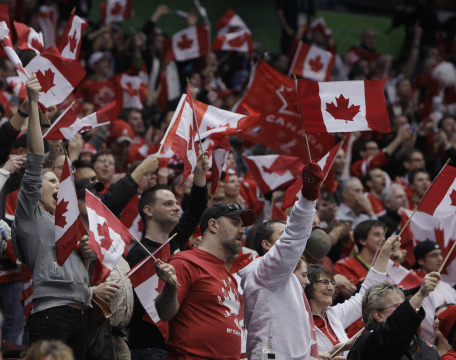 The game was a series of back and forth, in which Team Canada drew first blood in the first period with a goal from Jonathan Toews knocked in a rebound off of a bad turnover from Team USA. Corey Perry seemed to put it away for Canada with a goal in the second. Team USA came striking back with a hard shot by Patrick Kane tipped in by Ryan Kessler. After a ferocious third period where Canada ringed the posts a few times, Team USA put one in the final minute of regulation to continue the exciting game. The overtime was controlled mostly by Team Canada, the 4 on 4 play seemed to favor Team Canada’s skill and speed, and Team USA seemed unable to put anything together. After a nice play on the boards and a great pass Sid the Kid put it away past Miller to secure the gold medal, and send Team USA home with a respectable silver medal. I can’t say I’m not a little bit disappointed. I’m a huge hockey fan, and it was nice to see Team USA do so well in the games, and it would have been nice for them to finally win another gold. Especially since before the Olympics started Team USA seemed to be an underdog with many people thinking the best chance they had for a medal was the bronze. No matter what you say, Team USA had an amazing set of games, and played well against maybe one of the best teams ever put together for international play. Congratulations to both Team USA and Team Canada!